3ds Max Projects is a hands-on tutorial based book that aims to train you to be more proficient in using the different aspect of the software. In particular, this book covers modelling, rigging, lighting, particle effects and dynamics, and blending 3D with photography. All the exercises are quite detailed and includes plenty of screenshots and explanation. 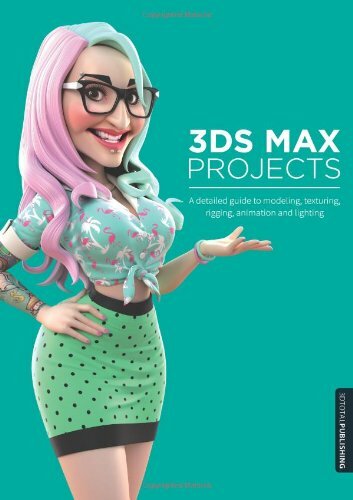 By the way, this book is for beginner-to-intermediate level users who already know the interface and main features of what 3ds Max can do. The modelling exercises are intensive and covers modelling of characters, one that is stylised and the other a more realistic caricature. There's also the modelling of a more inorganic subject like a tank. For some chapters, there are exercise files already set up for you, so you can just focus on learning the particular feature in the chapter, e.g. putting bones into a character that has already been modelled. The downside of the book is sometimes you'll need to use other software besides 3ds Max. Some of them include Photoshop which you should already have of course, then there's Zbrush because you need to import the characters there for touchup (sometimes using the Zbrush UV Master plugin). There's a section that requires V-Ray for rendering. The chapter on FX particles and Dynamics requires the use of Realflow for liquid, FumeFX for smoke. Overall, this 304-page paperback is an intensive course to using 3ds Max. It's good practice to get into more technical areas of using the software. Recommended for more intermediate users unless you're a beginner who likes to challenge yourself.